You get your morning latte from a drive-thru. You deposit money into your checking account at a drive-thru. You grab a burger and fries from—yep, you guessed it—a drive-thru. If you’re a fan of the drive-thru experience, you’re going to love All Storage’s EZ Drive-Thru storage option. Picture this: You drive up to the All Storage facility, enter your access code and then you drive inside the building. That’s right; the entire storage facility is under one roof. 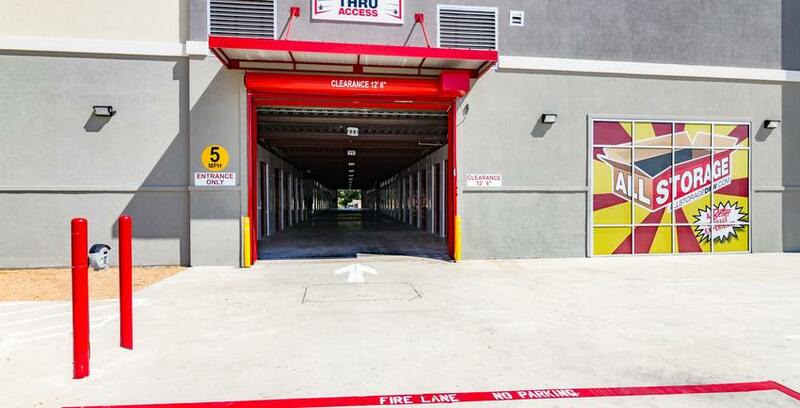 You can drive your car through the gates and right up to your storage unit. Here’s how EZ Drive-Thru can make a difference in your storage experience. The EZ Drive-Thru process is simple. All Storage believes in offering a customer-driven experience that makes self storage even more convenient than it already is. In other words, you can expect the EZ Drive-Thru storage process to be simple and intuitive. Once you reserve and rent a storage unit online, you’ll receive all of the information you need to access the storage facility, including the code that gets you inside. Next, load up your car with all of the stuff you need to store, drive to the facility, enter the code and drive into the building. You can park right in front of your storage unit. Have you ever had to complete a move on a really, really hot day? Or even worse, a rainy day? Moving is enough of a hassle as it is, but when you add in scorching temperatures, pouring rain or an icy sidewalk, the experience is downright torture. All Storage’s EZ Drive-Thru makes loading and unloading a lot more bearable. Because your storage unit is inside a building that you can drive into, it doesn’t matter what the weather is doing. Rain or shine, you’re literally covered. No sunblock, raincoat or worries necessary. In addition to offering protection from the elements, EZ Drive-Thru storage offers superior climate control. What exactly is climate control? We’re glad you asked. Climate control regulates the temperature and humidity levels inside your storage unit so that your items are stored in ideal conditions. Extreme heat and cold can adversely affect electronics, furniture and more, and high levels of humidity can breed mold and mildew. All Storage’s sophisticated climate control protects your belongings from heat, cold and humidity. No matter what you’re storing or how long you’re storing it, you can count on it being in good shape when it’s time to take it out of self storage. A great storage facility offers excellent security. This means gated access, good lighting, sturdy locks, surveillance cameras and staff members who are dedicated to monitoring the property. Yes, it’s true that you can find great security features at many storage facilities, but All Storage offers an added layer of protection. EZ Drive-Thru puts the entire storage facility under a roof, making it extremely challenging for burglars to gain access to units. There are no walls to scale or gates to duck under. Your storage unit is inside a building that only you and other tenants have access to.